Thank you for your help on the design brainstorm session. Below are the mockups for the final site theme based on some of the ideas we talked about. 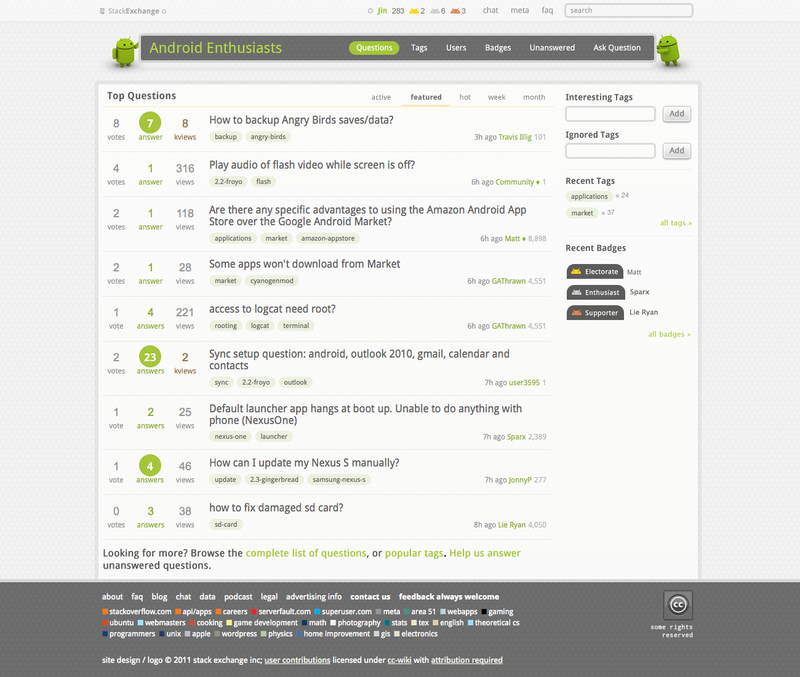 The design goal is to give this community a distinct look and feel, while still looking like a part of the Stack Exchange network. So I'm not making any layout changes. The design should also reflect the Android branding. After looking at numerous Android related sites and UI patterns, I've become a big fan of its simplistic and elegant designs. For the overall look and feel, I want to keep the site airy and clean. The faint honeycomb pattern in the background provides a pleasant noise, but does not get in the way of the content. I also think "Honeycomb" is an appropriate pattern to use because of the Android tablet name. For the most of the site elements, I went for a "flat" look, polished by hints of translucency. The 3D effects are only reserved for action items such as buttons and widgets. Of course I'm also using the established green (#A4C639) from the Android branding. For the typeface, I'm using Droid Sans. Please let me know what you think. Assuming there are no major design changes, the site will launch very soon. A very pleasing selection of colours, however looking at the images, isn't there a bit too much wasted screen real estate on either side? 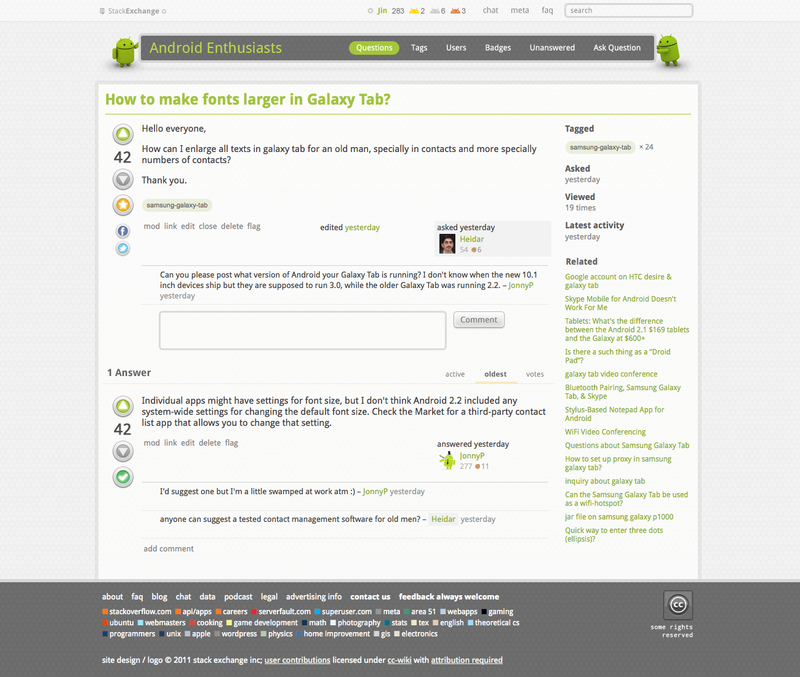 Also, I hope this is a fluid layout and renders well on most browsers including those on Android devices. Finally - since we depend on QUESTIONS from users, perhaps the ASK QUESTION could be made more noticeable (either via a change of colouring or font / size)? Love it, love the badge icons and the Andy's holding the banner up at the top, and the overall fairly clean look, with that bit of fun. Not totally convinced about the honeycomb background, but also not sure what it could be replaced with. One suggestion might to do with just making the bar at the top subtly ape the Android notification bar, by removing the background from the top bar, leaving it as a solid colour (or a slight gradient) and left aligning StackExchange logo, while right aligning the search box and icons, username, etc. Anyway love it overall and don't take this as a criticism. I like it. I especially like the badge icons. Nice! My only gripe is that the "Recent Badges" puts the badge icons on an awfully dark background -- darker than even the header and footer banner background. That seems off to me, because it makes recent badges (which, I'll grant, are important) look like the most important thing on the page. I wonder if they couldn't be on a lighter background?